What if you had a copy of the test before the actual exam? And your history teacher gave it to you - complete with answers? No, you're not dreaming! The book you hold in your hands right now is filled with 22 real midterm and final history exams - each with actual, detailed answers designed to help you do your best when you open that blue book. 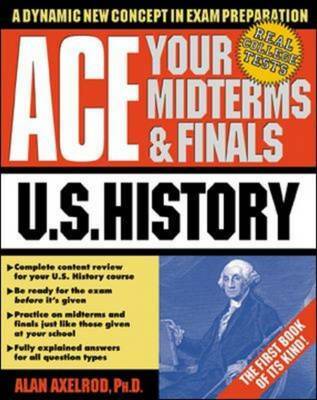 Culled from dozens of familiar colleges and professors nationwide, "Ace Your Midterms and Finals: U.S. History" is a sure-fire, totally legit way to relieve the stress of test taking once and for all. In this one-of-a-kind test preparation guide, you'll discover: 11 midterms and 11 final exams from colleges just like yours; real-world practice on real-life exams; a complete and concise review of your entire U.S. History course; savvy advice from the teachers who teach the courses; plus effective methods for mastering history.Sharpen your history skills with 4 easy steps: Part One: Preparing Yourself - learn what professors look for; how to think like an historian; the secrets of successful test taking. Part Two: Study Guide - covers the major wars, westward expansion, colonial America, and more - with quick-and-easy overviews of what you need to know. Part Three: Midterms and Finals helps you to practice with real exams (complete with real answers!) contributed from colleges like yours - Michigan, Berkeley, Purdue, and dozens of others. Part Four: For Your Reference - arm yourself with a handy chronology of key dates and events.